When: the ‘Mirapuri World Literature Fest 2011 will take place from October 28 to October 30, 2011. Presentation of books and multimedia by the Mirapuri authors Michel Montecrossa, Mirakali, Sri Aurobindo and Mira Alfassa in english and german language. The Spirit of Woodstock Festival 2011 Flashback presents images of all participating musicians and the soundtrack ‘Happy For You’ by Michel Montecrossa. Michel Montecrossa, Mirakali, Diana Antara, The Fabulous Sound Sisters, David Butterfield, Coffee After, Jaspoia Lee, Groundswimmer, Vortice di Nulla, Old Morgen, N.S.J.B., Full Tank, Jales und Knopf, Seaward, Cherries on a Blacklist, Il Vile, Menestrello, Blank Manuskript, Undiscovered Soul, Nekrosun, Looceedee, Witche’s Brew, MaryHell, Blak Vomit. CyberRocker Michel Montecrossa (MichelMontecrossa.com) started the Spirit of Woodstock Festival (www.SpiritOfWoodstockFest.com) in Mirapuri together with the Mirapuri Rainbow Gathering and Mirapuri’s one and only original Bavarian Oktoberfest in Italy. The Spirit of Woodstock Festival is creative with the mighty dream of Unity, Love and Freedom. Guest musicians from all over the world come together to play and sing along with Michel Montecrossa and his band The Chosen Few and an enthusiastic audience for ten days and nights every year in July / August. Since its inception the Spirit of Woodstock Festival in Mirapuri together with the Mirapuri Rainbow Gathering and Mirapuri’s one and only Bavarian Oktoberfest in Italy has developed into a great Free Music Event with free entrance, free camping, friendly prices for food, drinks and Hotel accommodation and with an international flair and inimitable atmosphere of Love and Joy. I’m happy for you I’m the seer-man. / Happy for you is my reality dream. / Happy for you is my time and space. / I’m happy for you I’m intense and great. The forgiving dreams of human existence. / The nowhere flowers of here and there. / The situation-experience always escaping. / The borderzone of the vague and the near. I’m happy for you, I am the new melody. / Happy for you I am the player. / Happy for you the revealing direction. / I’m happy for you, the sweet vibration. The creative fire is a-heating up / the action, I say, of universal love, / the hand-on-the shoulder intimacy, / the urgent, comforting involvement. I’m happy for you, the first-rate performance. / Happy for you the rebellious intention. / Happy for you the elusive statement. / I’m happy for you, the new direction. Dream it and do it, don’t be second. / Violence is on the pitch. / Multidimensional signs they are a-coming. / Straight forward, I say, is my time-spirit kick. of unity and action for a better world. From the march of the million in Israel / to the march of millions everywhere / “LISTEN TO THE YOUNG MILLION RAP” / It’s easy to expand into a better world / of free education and free health care. / “LISTEN TO THE YOUNG MILLION RAP” / Of affordable housing and jobs for all, / of fair wages and the joy for all, / “LISTEN TO THE YOUNG MILLION RAP” / of celebrating love through action of us all. 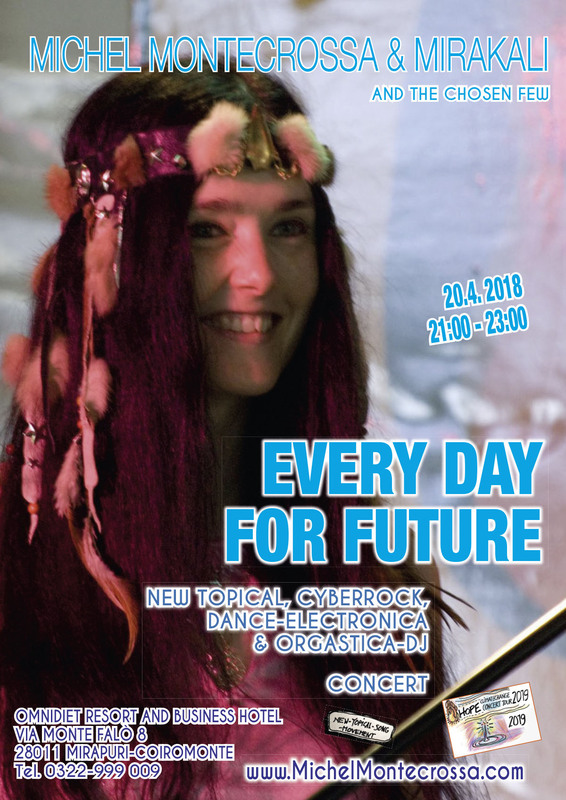 ‘Future Earth’ released by Mira Sound Germany on Audio Single and DVD, is Mirakali’s New-Topical-Song about Future Earth rising. “Urgent action is needed, action of love that knows and not suppression, bloodbath and police brutality. Urgent action is needed, action of love that gives jobs, kindness, respect and hope, understanding and happy change. Future Earth rising from the depth / high into the light of a new becoming. / Future Earth is a star that illumines the night / and lets all darkness disappear with its warmth and love. Future Earth is a new life for a planet and all its beings. / We move towards the tender light of mighty love. / We know with certitude that the good will win. / Love is our strength. Love is our path out of darkness / towards the golden ocean of delight. The Future Earth is our paradise. / Flowers and meadows bloom with the smile of heaven. / The planet is green and strong with all its woods and oceans. / Future Earth comes from within. Future Earth lives in the wind and whispers to you: / “Wake up, wake up and move towards the light.“ / The future is bright. The future is the goal. The future is love and peace, the future is world unity. / The future is worldwide harmony. / Future Earth brings the kingdom of heaven upon earth. / On Future Earth we all are free. Future Earth is for a new humanity. / Future Earth is friendly and grows with tender power / towards a star of happiness and peace, / oneness and harmony in a cosmic new creation.